Many companies isolate elements from an herb, concentrate them, and label it “whole herb.” New Chapter delivers the wisdom of whole food. Using only natural supercritical CO2 or traditional techniques of extraction, our Force extracts guarantee the fullest spectrum of beneficial phytonutrients in their natural profile. Organic Oregano helps reduce oxidative stress, is a free-radical scavenger, and supports a healthy immune system. 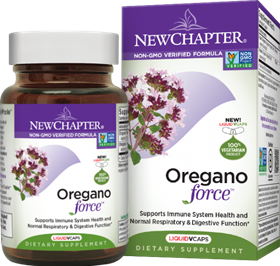 The full spectrum of beneficial compounds found in Oregano Force is delivered using a supercritically extracted, whole-food approach to herbal supplementation. Used by ancient Greeks, the oregano leaf was lauded for its ability to support normal respiratory and digestive function. Our full-spectrum process extracts precious plant compounds to preserve Nature's full complexity, delivering super-pure, super-potent herbal extracts.